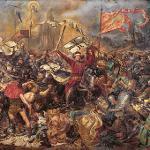 Lithuania and Poland annually observe Battle of Grunwald Day. This battle was fought on July 15, 1410 between the alliance of Kingdom of Poland and the Grand Duchy of Lithuania and the German-Prussian Teutonic Knights. The Battle of Grunwald was one of the largest battles in the history of Medieval Europe, and it also became one of the most important victories of Poland and Lithuania. Later the battle became a symbol of fight with invaders and a symbol of national pride. Annually Poland and Lithuania reenact the Battle of Grunwald. This event may be held on any day from July 11 to 15. The most common day for reenactment is July 15. The largest reenactment was hold in 2010 in Poland, that marked the 600th anniversary of the battle. The reenactment and various events lasted from July 12 to July 18. Every year people from Poland, Lithuania and other European countries come to watch the reenactment of the battle. About 4000 knights gather in the camp. Tourist also can visit local exhibitions of medieval clothes and armor.